Hevi Haul Australia is an Australian-owned and managed company with extensive experience with low loader hire in Australia. We have been proudly servicing clients with heavy haulage and oversized transport needs for over a decade and have maintained our reputation to this day. Our clients rely on us to deliver quality and reliable services, and when you contact us, we’ll ensure you get effective heavy-duty transport solutions. Contact us today. Our low loaders are used for transporting huge equipment and machinery and can handle loads ranging from 25 to 150 tonnes. If you are looking to move a sizeable object or piece of equipment, our low loader hire team will make sure it arrives safely and securely. 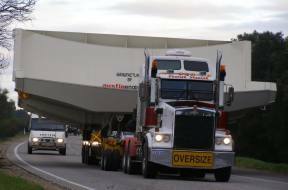 Moving extremely heavy and large machines or equipment is a large undertaking, that’s why at Hevi Haul we have made it our mission to help Australian companies with their heavy haulage and low loader transport requirements. Our entire staff is well versed in the art of moving oversized loads. Using our loaders, combined with our reliable, experienced team, who are not scared to get their hands dirty, we will ensure a successful completion of your transport job. Most companies do not require heavy haulage too often, which is why purchasing a low loader would not be cost-effective; that’s where we come in. Our low loader hire rates are affordable for the supply of quality transport solutions at short notice. You can make use of our low loader hire services for long or short-term projects; and our range of options means you can move objects across the state and the country with ease. While our core business is low loaders we also offer comprehensive heavy haulage services. These additional services allow us to deliver large loads, on time and within budget. If you’re battling with how to transport large loads, get in touch. What’s more, we’re more than happy to fetch it and deliver it to any destination in the country. Health and safety – Our commitment to the highest standards of safety is unwavering, and evident in our enviable 100% safety record. Diverse and in-depth experience – For over a decade, Hevi Haul has specialised in providing services to the mining, fabrication, construction, and earthmoving industries. Value for money – We offer reliable, efficient and affordable low loader transport for a wide variety of oversized loads. Convenience – We have a diverse fleet of transport solutions readily available to collect and deliver virtually any load, at your request. Hevi Haul is well respected across the industry for our high level of customer satisfaction and efficiency. We welcome new challenges, regardless of their size. It keeps our clients returning to us time and again. Got a heavy load you need to transport? Contact us for your next heavy-duty transport job ands make use of our low loader hire services.